Those local people defending CEO Aubrey McClendon in the onslaught of recent media criticism should realize that the real issue for this area is keeping Chesapeake Energy Corp. in Oklahoma City as a viable business that employs a large number of people. It’s about the company, not one man and his “lavish and leveraged life.” Rank and file employees at Chesapeake are undoubtedly more focused on whether they are going to have jobs or not over the employment fate of their ultra-rich boss. If McClendon, pictured right, is the person who can keep the company intact and in Oklahoma City despite falling natural gas prices that have led to a steep drop in the company’s stock price, then so be it. If not, then McClendon will be fine, folks. Don’t worry. None of that is to excuse some of his actions. Reuters has reported that McClendon and his family on one vacation took flights that cost $108,000 that he later charged as a business expenses. Some nine female friends of McClendon’s wife flew to Bermuda in 2010 for $23,000 at the company’s expense, the news agency also reported. Are these expenses a part of a pattern of excess and irresponsibility in the operation of a public company, and do they show McClendon lacks judgment or perhaps at one time felt invincible or both? Note the word “public” in the last sentence. Shareholders have a right and responsibility to hold McClendon accountable and make the company’s business as transparent as possible. More importantly, as Reuters has reported, McClendon has until now “put longtime friends on the Chesapeake board and showered them with compensation.” Did friendship and the large compensation, which is estimated at more than $500,000 annually for board members, contribute to the company’s financial decline through the rubber stamping of McClendon’s aggressive business model? As we know, McClendon is no longer chairman of the Chesapeake board of directors, and two board members, Burns Hargis and Richard Davidson, have resigned after shareholders refused to support them with a majority vote. More board changes are expected. 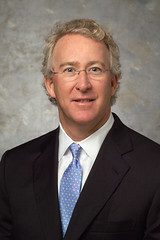 McClendon remains as the company’s chief executive. Hargis’ former role in the company seems especially interesting given that he’s president of Oklahoma State University. Shouldn’t a president of a public research university feel a special responsibility to fiduciary duty as a leader in a public company, especially in a company that has such a major economic impact in his state? The bottom line, though, is that natural gas prices have plunged in the wake of a mild winter exposing McClendon’s strategy to rapidly purchase and drill. Things would probably be different for the company if the country would have experienced a frigid winter this year, but that’s the natural gas business. The country could experience a mild winter next year, too. In the end, what’s important for all of us in this area of the state is that the company continues to contribute to the local economy in a major way. It would be devastating for the Oklahoma City area if Chesapeake were relocated or tremendously downsized if sold off in pieces. For better or worse, in a sense, we’re all in this together here. I’m rooting for the company, not one man.